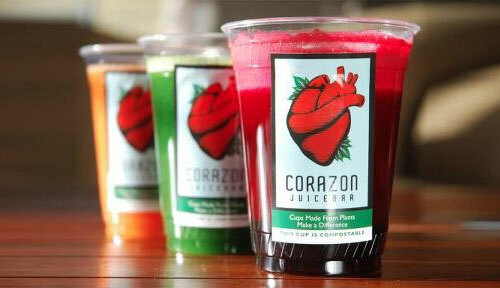 Corazon Juicebar is a Mexican-style juice bar in the heart of the Mission district in San Francisco. The juice bar is run by Socorro and Cesar Ramirez, a mother and son duo. Corazon takes authentic flavors and applies them to a menu for the health-conscious individual who aspires to make his or her diet as organic as possible with locally grown produce and ingredients. Many of the flavors are taken directly from old secret family recipes. The delectable beverages and snacks are fresh and free of artificial sweeteners and preservatives. Corazon makes tasty treats and pride itself in preparing everything in a simple and healthy manner to satisfy its customer's body, heart and soul. Cesar's brother, an architect, artist and builder, designed the Juicebar. The beautiful awning, door, counters, storage and vintage, glass bottle lamp were all designed and constructed by his brother with the help of his family. Corazon is committed to greeting its customers with exquisite service demonstrating graciousness, efficiency, knowledge, and integrity.